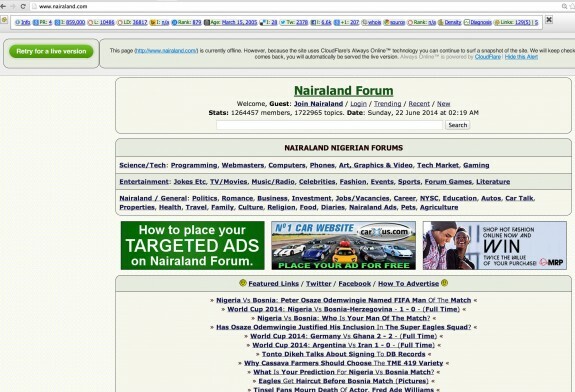 Ok, the number one forum in Nigeria and one of the most popular websites in Nigeria is down; Nairaland is down !!! It’s actually been down for about 48 hours as at the time of this writing i gather. I have tried to reach the site for quite sometime but it just would not load at a point I just gave up, thinking the problem was with my ISP. Today, I decided to give it a shot again and I still couldn’t reach it; I somehow felt incomplete, i visit Nairaland everyday to catch up with what is happening in Nigeria and not being able to reach it was very frustrating, I felt incomplete. My frustration was amplified 100 folds by the mere fact the 2014 world cup is going on in Brazil and I have a few clients I handle digital for, one of the platforms I planned to use for their marketing campaigns was Nairaland. During live matches, I am always on the football thread following up on comments on the live matches, while I don’t contribute much to the discussions, it’s always so much fun reading what people have to say about the games being played. Watching the Nigerian games in particular and following the football thread really is an awesome way to enjoy football if you ask me. You get a lot of fans banter and a lot of insights into the games. Why was one of my favourite website down? I decide to check out the owner’s twitter handle for a bit more information and below is what I found. Seun Osewa owns Nairaland by the way. 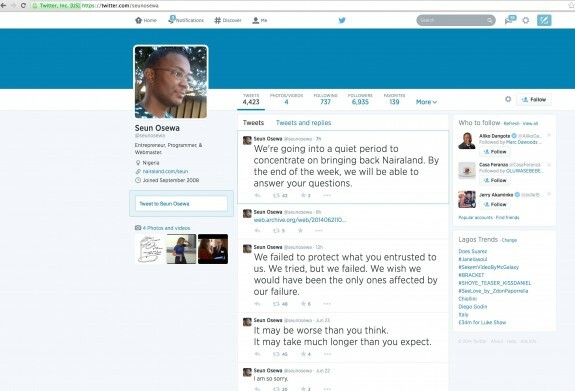 Despite being bombarded with questions from users of the platform online, Seun has refused to comment or give a reason for why the website is down. This is understandable as he needs time to get the forum back online. he’s just one guy after all. If Seun is making money from this forum, now might be the time to actually recruit a full team to actually manage this. A dedicated social media support person would be a great start to attend to all the queries raised. Who answers the questions of the brands who have advertising “money” tied down in their accounts ? In this regard Seun needs to “man up” and put a proper structure in place, he can’t be the go to guy for everything Nairaland forever. From the comments above, I suspect that the website was hacked or it crashed. I can’t say for certain but it looks like it. Cloudflare is supposed to offer protection to websites that use its service so I really can’t say what went wrong here. According to Seun, the site will not be up any time soon too, so I am guessing this was something really major that he is trying to resolve. We can only just wish and pray that Seun is able to resolve this and bring this site back online as quickly as possible as many of us really cannot do without it for information and networking. Many brands would have planned to target their ads at soccer lovers during this world cup too, I guess they would have to pray harder for the website to come back quickly. Seun for me represents one of the true success stories of an online entrepreneur in Nigeria. He brought this forum up from nothing to be one of the most visited websites in Nigeria. As at last count there were over 1.3 million registered users on the platform, the highest by far for any Nigerian owned website. Nairaland needs to survive this because of what it represents to Nigerians. Am sure Seun did his best to protect his “bread and butter”, but this is a lesson to all online entrepreneurs and startups; you need to be “big” about security; especially if your site / online business is generating so much traffic and revenue already; you want to ensure you can scale along with the traffic hitting your website so the website doesn’t crash online load. You want to ensure you have security at the top of your mind always; always apply the latest security patches; never install illegal /cracked software and scripts, make sure you have effective firewalls in place; and last and definitely not the least …BACKUP !!!! Backup like your life depended on it. Be paranoid about backup !! Backup everyday; in fact backup multiple times a day, backup to the online server, backup to a replica server, backup to an external ftp server, backup to your offline secure storage. You never can have enough backups. It might sound expensive but trust me it’s not, storage has become to cheap that the cost could actually end up being negligible. You just want to do everything possible to ensure that when you go down, customer information is secure and you can return get back online as soon as possible. Seems the forum is back online but with a lot of data loss. From what I see the latest unaffected backup they seem to have is for January 10, 2014; that’s about 5 months of data loss, that’s massive for a forum like Nairaland. Brings me right back to my point; be paranoid about backup !!!! After an attack or a crash, it pays to have the option to revert back to various points in the past. Backup can be automated too, so no one has to be doing it manually which could lead to human errors. All backups should however be bested from time to time. I’m a fan of both the man and the site so I hope this is sorted out post-haste. I would like to believe that the problem is beyond ‘simple’ backup. The Nairaland brand has grown to the extent where it needs to be aggressively protected against typical/routine threats and eventualities. The bigger you are, the less forgiving the public will be. I have had a site hacked before and since then, despite learning as much as I could about site security, I have also made sure to pay for 3rd party monitoring and remediation for critical sites. Too true Aide. 3rd party tools are great. But eventually if and when everything breaks, there’s nothing a a “simple” backup. The simple logic to follow here is; if something can go wrong, it will. I know he uses Cloudflare, which normally adds some “hardening” to your site. This was a disaster, a proper disaster recovery plan could have had him back online in a few hours at most. If his host is to blame for this, he could restore his backup on a new server, re-point dns and be back online quickly. Sessimi has same design as your favourite nairaland and even has a lot of exciting games to enjoy.